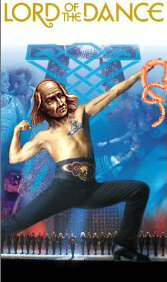 Nothing spells terrible devastation and intestine-flinging like Riverdance. Dear fluffy lord for the love of everything unholy please yes! I would love music that makes me jump up out of my chair and run around the house in boxers swinging an imaginary sword (this never happened when I first loaded Skyrim. Never.) Friggin Hobbit's "Misty Mountain" has been stuck in my head for 3 days now. Seriously though it's a great touch when dev's manage to create a catchy and powerful theme that *fits* the game well. If anyone could pull it off, it would be you-know-who. ...sorry, had to do it. KOTOR's theme was great, it was something new whilst at the same time feel awesomely Star Wars. The Final Fantasy series has likewise done a good job with its main theme. So yes, a nice discintive theme would be good for the series - one that isn't too fantasy-esque with the late medieval focus of the game. What about Legends of Eisenwald? They have some INCREDIBLE music. They should get Deltron 3030 to do the theme. Music can do much more for atmosphere than nifty graphics and voice-out, I still catch myself humming the Fellowship Theme from Ultima 7 now and then, just like Engagement and Melee from Ultima 5/6 and of course Stones, let's not forget the ending of Ultima 6, joining the Britannia and Gargoyle theme, a masterpiece in its own right, and a worthy conclusion of your 200+ hours quest to end this war. For me, when it comes to storytelling and atmosphere, Ultima 5 - 7.2 are still the measuring stick for any other (western) RPG. The BG series is a close followup but still doesn't play in the same league. PS:T almost made it there as well, just missing the music to compliment the storytelling. After these 7 games and their addons there is a large gap where each and every japanese RPG fits in before the rest of the western RPGs catch up. Heck, for ol' times' sake: Nastassia's theme. What I also love in soundtracks is variations, like most Star Wars songs having some elements of the main theme, or the Variations of "Call of Magic" in Morrowind, Oblivion and Skyrim. Edited by JOG, 07 January 2013 - 10:54 AM. I think the Drakensang series had a pretty decent soundtrack, ranging from merry fantasy to dark and brooding. It's worth a watch. There is a lot of different folk music in the world, it's not really one genre. Sardinian folk music is different from slavic folk, which is a world of difference from American folk. Absolutely, just listen to the Legends of Eisenwald soundtrack. It's epic but it's also got a lot of European folk influences, or dare I say renaissance music influences. That's what flutes and lutes are all about. Renaissance, man. Bring on the renaissance. Can't think of a game that has ever done that. All games are all epic drums and strings - can't stand that anymore. It's all the same.